The government is seeking concessional or free aid from the Chinese government to finance “a large portion” of a project to build a bridge connecting the capital Malé and Hulhumalé, President Yameen has revealed. “So we discussed amongst ourselves and agreed that the most important project is the ‘youth city’ and the bridge between Malé and Hulhumalé as part of efforts to ease housing [shortage] for the people,” he said. Yameen noted that as “all major Chinese companies are government companies” – referring to proposals submitted by Chinese companies expressing interest in the project – Chinese corporations would undertake the project with the “blessing” of the Chinese government and would be able to secure loan facilities through “generous concessional assistance”. The government delayed awarding the project until after the China trip for this reason, he added, during which official talks would take place. 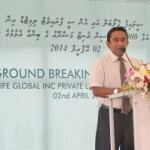 If the bridge project is to be awarded “under commercial terms,” Yameen said the government has “solid three proposals”. However, Yameen expressed confidence of securing assistance for the project during the official talks. Asked for an estimated date for commencement of the project, Yameen said that the talks so far had been “unofficial” but noted that an engineering team would arrive as soon as the Chinese government gives the “green signal” and a feasibility study would be conducted. Yameen said he expected the project to begin before the end of the year. Chinese assistance could be either in the form of grant aid or a loan facility from the Chinese EXIM Bank at a low interest rate, he explained. In addition to the bridge project, the government also expects to upgrade the Ibrahim Nasir International Airport with a new runway and a new terminal, Yameen said. The government has also formulated a project to provide electricity to the Greater Malé Region – including Hulhumalé, Vilimalé, Thilafushi, and Gulhifalhu – from a “single grid” and generate about 500 megawatts, he revealed. A number of Chinese companies have meanwhile sought information regarding the ‘iHavan’ transhipment port project, Yameen said, adding that he believed various components of the project would be awarded to different parties. Other projects that would be discussed with the Chinese include the establishment of “a data bank” through the “Smart Maldives Project,” he continued. Referring to the Chinese ‘New Silk Road’ project, Yameen said the government was “very interested” in participating in the initiative. Chinese news agency Xinhua reported yesterday that China’s maritime ‘Silk Route’ would pass through the Ihavandhippolhu Integrated Development Project or ‘iHavan’ in the northernmost atoll in the Maldives. A transhipment port in the northernmost atoll would benefit from “the growing trade volumes passing through the region in the wake of strong growth in China and India,” Xinhua noted, adding that an export processing zone in iHavan would enjoy “duty free access” to South Asia through the South Asian Free Trade Arrangement (SAFTA). “Our positions at the UN and other key multilateral forums highlight the close cooperation between our two countries,” Yameen told Xinhua in an exclusive interview. God knows best what trade was done on the famous silk route! Hope the Chinese are not at it! If China is going to start the same trade; God have mercy! Could the new vessels beat the famous "Cutty Shark" (believed to be a ghost ship) and the rest in their trade! (1) Most of the population have no access to safe drinking water. (2) Most of the population have no access to sewage systems. (3) Most of the population have no access to acceptable medical care. Yet, a bridge between Male and Hulumale and a "youth city" is seen as the most pressing need of the country! The China Bridge in the Maldives! The Chinese gave $16 million for development projects. That might buy enough nuts and bolts for the bridge, maybe.